Gas meters measure the amount of gas used by counting the filling and emptying of compartments inside the meter. To find out how much gas was used over a certain period of time - such as one day or a billing period - take a "reading" at the beginning of the period and again at the end. The difference between the two readings is the amount of gas used. Residential gas meters have one or two dials marked 10 feet or less. These should not be read. They are for testing only. Although your meter dials may not look quite like the ones here, these instructions can be used to read most residential meters. Each dial represents a single number in the reading. When the hand seems to be directly on a number, look at the dial to the right. If the hand on that dial is on or just past zero, write down the number the hand is pointing toward on the dial you are reading. 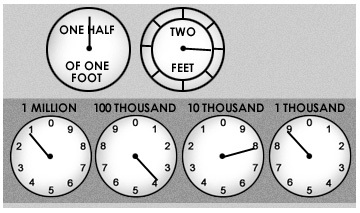 If the hand on the dial to the right hasn't reached zero, write down the smaller number on the dial you are reading. When reading the far right-hand dial, write down the number the hand appears to be pointing toward, because there is no dial to the right to check. The correct reading for this meter is 1378. This means 1378 hundred cubic feet (CCF) of gas has passed through the meter since all dials were on zero. Another way to write this amount is 137,800 cubic feet. To compute your gas bill, the number of CCFs* used during the current billing period is multiplied by the current Btu factor to determine the number of therms used.